106th District Candidate Robert Kennedy was investigated this weekend for removing his opponent’s campaign signs from a location in Presque Isle County. 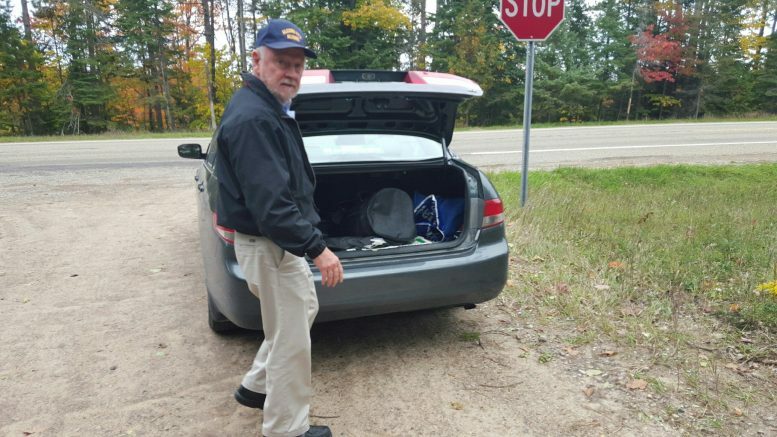 On Saturday, Presque Isle County Sheriff’s Department received a complaint from a Rogers City resident who said he witnessed an older male removing and loading several campaign signs into the trunk of a car. The man confronted the subject and took a cell phone photograph of him and the vehicle. After running the plates and investigating the photographs, the sheriff’s department determined that the man removing the Sue Allor and Jack Bergman campaign signs, was Robert Kennedy. Kennedy called the sheriff’s department and admitted to removing the signs from the Ocqueoc area of US–23. He said he had plans to return the signs to Sue Allor, as the two are friends and have an agreement to return improperly placed campaign signs to one another. Presque Isle Sheriff’s Department then made contact with Allor who said Kennedy did indeed return the sign, but denied their being any pre–discussed arrangement between the two. Allor also mentioned that only the lettered part of the sign was returned to her. In an official statement made to WBKB, Robert Kennedy apologized for his actions, but maintained that the signs were improperly placed. “I apologize for my actions over the weekend in removing two political yard signs that did not belong to me. They were placed too close to the US–23 highway, but it was not my role to remove them. And for taking on that role I am sorry. Before the police contacted me, I had returned the sign to my opponent,” stated Kennedy. Kennedy has been informed to not remove improperly placed campaign signs, and to report them to law enforcement first. With just a few weeks until the election, local Republican leaders are questioning Kennedy’s judgment after the incident. “It’s not petty politics, which we usually see right before an election day. I think what this shows is a sincere lack of judgment by Mr. Kennedy, somebody who is running to represent the people of the 106th district, and frankly I fear it’s a sign of how he would act as a state representative, and the people of Northeast Michigan deserve much better,” said First Congressional District Republican Committee Chairman Jesse Osmer. Sue Allor has chosen to not press charges.